Patagonia Cruise - Darwin's Route from Ushuaia. Cruise the hidden treasures of Argentina and Chile! The end of the world awaits you on the expedition cruise ship MV Stella Australis on a journey that retraces much of Darwin’s route through the Fuegian Archipelago aboard HMS Beagle. This eight-day Ushuaia excursion features the legendary Cape Horn, historic Wulaia Bay, spectacular Glacier Alley, and the penguins of Magdalena and Tucker Islands, as well as ice fields, fjords, sub-polar forests and secluded beaches at the southernmost extreme of South America. This afternoon in Ushuaia board the Stella Australis, a state-of-the-art cruise ship to begin your Patagonia travel adventures. Check in at 409 San Martín Street, Ushuaia, from 10:00 AM to 4:00 PM and board at 5:30 PM. After a welcoming cocktail reception hosted by the captain and his crew, the ship departs for one of the most remote corners of planet Earth. 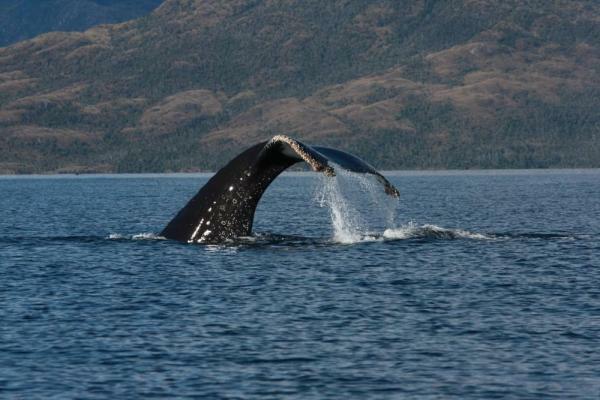 During the night traverse the Beagle Channel and cross from Argentina into Chilean territorial waters. The lights of Ushuaia disappear as the ship turns into the narrow Murray Channel between Navarino and Hoste islands. By early morning, Stella Australis is cruising across Nassau Bay into the remote archipelago that includes Cape Horn National Park. Weather and sea conditions permitting, go ashore on the windswept island that harbors legendary Cape Horn (Cabo de Hornos). Discovered in 1616 by a Dutch maritime expedition, and named after the town of Hoorn in West Friesland, Cape Horn is a sheer 425-meter (1,394-foot) high rocky promontory overlooking the turbulent waters of the Drake Passage. For many years it was the only navigation route between the Pacific and Atlantic, and was often referred to as the "End of the Earth." The park was declared a World Biosphere Reserve by UNESCO in 2005. The Chilean navy maintains a permanent lighthouse on the island, staffed by a lightkeeper and his family, as well as the tiny Stella Maris Chapel and modern Cape Horn Monument. In the morning, navigate across the northeast arm of Beagle Channel to disembark at Pía fjord. During the afternoon you will enter the Garibaldi fjord to appreciate the glacier bearing the same name from the ship. 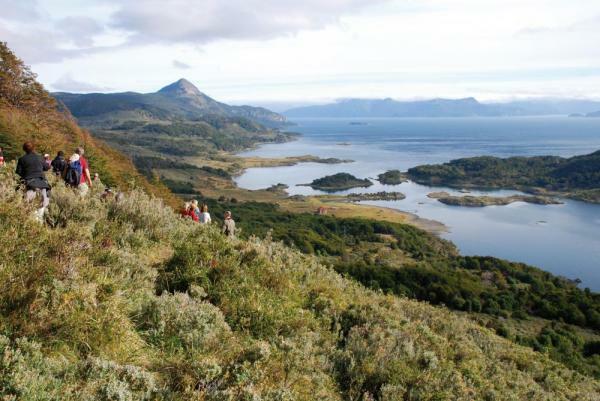 After nightfall reenter the Beagle Channel and sail westward along the southern edge of Tierra del Fuego into a watery wonderland protected within the confines of Alberto de Agostini National Park. Part of the channel is called Glacier Alley and on full moon nights you can often see several of the seven major glaciers that give the passage its name. Rounding the Brecknock Peninsula as the western extreme of Tierra del Fuego, Stella Australis is for a brief time exposed to the open Pacific. Navigate a zigzag route through the Cockburn Channel, Magdalena Channel, and Keats Fjord to reach scenic De Agostini Sound. Named after an Italian Salesian priest who worked among the region's indigenous people during the first half of the 20th century, De Agostini Sound is flanked by numerous glaciers and sheer saw-toothed peaks reminiscent of Torres del Paine. Your shore excursion this morning is Águila ("Eagle") Glacier, which hovers above a placid glacial lagoon surrounded by primeval forest. After a Zodiac landing on the beach, passengers hike around the edge of the lagoon to a spot near the base of the frozen facade. Condors can sometimes be seen winging high above, but there is always abundant bird life around the lagoon. This landing provides the perfect opportunity to experience the beauty of Patagonia’s sub-Antarctic rainforest and to see how the power of nature has molded the spectacular landscape. After an overnight cruise across Admiralty Sound and back into the Strait of Magellan, anchor off Magdalena Island, which lies about halfway between Tierra del Fuego and the Chilean mainland (camera extension poles are prohibited on Magdalena Island). Crowned by a distinctive lighthouse, the island used to be an essential source of supplies for navigators and explorers and is inhabited by an immense colony of Magellanic penguins. At the break of dawn, weather permitting, go ashore and hike a path that leads through thousands of penguins to a small museum lodged inside the vintage 1902 lighthouse. Many other bird species are also found on the island. 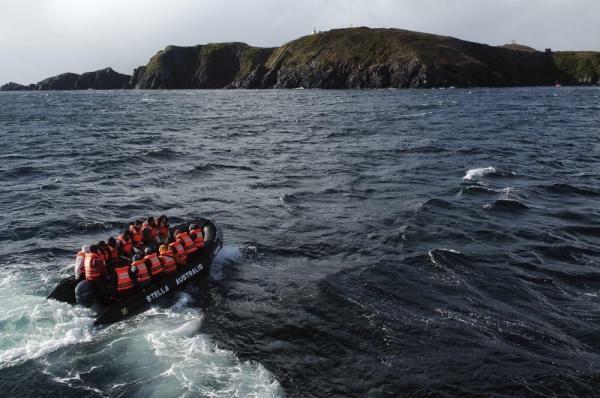 In September and April, when the penguins dwell elsewhere, this excursion is replaced by a ride aboard Zodiacs to Marta Island to observe South American sea lions. After a short cruise south along the strait, disembarkation at Punta Arenas is scheduled for around 11:30 AM. You are free to explore Punta Arenas, founded in 1848 by Chilean settlers and now the capital of Chile's Magallanes & Antarctica region. There's plenty to keep you busy in the city: the Magellan Monument in the Plaza de Armas, the Magallanes Regional Museum (Casa Braun-Menéndez), the Shackleton Bar in the Hotel Jose Nogueira, the excellent Salesian Museum, the flamboyant Municipal Cemetery, and the Nao Victoria maritime museum with its full-sized reproductions of Magellan's flagship, HMS Beagle, Shackleton's rescue craft, and the Goleta Ancud pioneer ship. Reboard Stella Australis at 6 PM. After a welcoming cocktail reception hosted by the captain and his crew, the ship departs on the second half of the journey. During the night, the lights of Punta Arenas fade into the distance as the ship crosses the Strait of Magellan and enters the Whiteside Canal between Darwin Island and Isla Grande de Tierra del Fuego. By dawn the ship sails up Admiralty Sound (Seno Almirantazgo), a spectacular offshoot of the Strait of Magellan that stretches nearly halfway across Tierra del Fuego. The snowcapped peaks of Karukinka Natural Park stretch along the north side of the sound, while the south shore is defined by the deep fjords and broad bays of Alberto de Agostini National Park. Go ashore at Ainsworth Bay, which harbors copious bird life and a colony of southern elephant seals which can sometimes be spotted from the Zodiacs. Two guided excursions are available: one is along the edge of a stream, peat bog and beaver habitat to a waterfall-and-moss-covered rock face tucked deep inside a pristine sub-polar forest; the other is a more strenuous hike along the crest of a glacial moraine. Both afford views of Marinelli Glacier and the Darwin Mountains. Leaving Ainsworth Bay behind, sail west along the sound to the Tucker Islets. 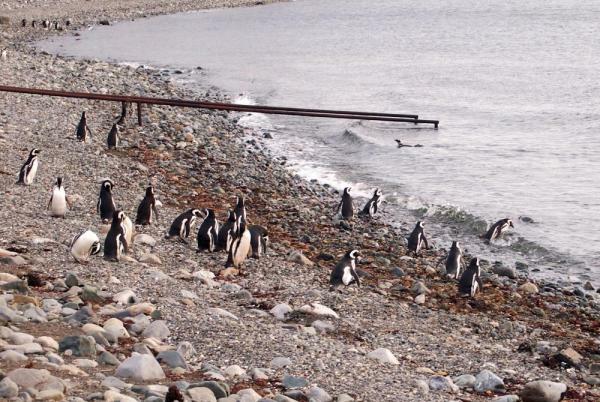 After lunch, board the Zodiacs again for a close-up view of the Magellan penguins that inhabit the tiny islands. More than 4,000 penguins use Tucker as a place to nest, give birth, and nurture their chicks. Many other bird species also frequent the area including king cormorants, oystercatchers, Chilean skuas, kelp geese, dolphin gulls, eagles, and even the occasional Andean condor. In September and April, when the penguins live elsewhere, this excursion is replaced by a short walk to a glacier at nearby stunning Brookes Bay. Overnight sail around the western end of Tierra del Fuego via the very narrow Gabrial Channel, Magdalena Channel and Cockburn Channel. After rounding the remote Brecknock Peninsula, the ship tacks eastward and enters the Beagle Channel again. By morning enter Pia Fjord and board the Zodiacs for a shore excursion to Pia Glacier. After disembarking take a short hike to gain a panoramic view of the spectacular glacier, which extends from the mountaintops down to the sea or a longer much more difficult walk up a lateral moraine of the old Pia Glacier. No one knows for certain how the hulking mass of snow and ice got its feminine moniker, but one theory says it was named for Princess Maria Pia of Savoy (1847-1911), daughter of the Italian king. Back onboard the ship, continue east along the Beagle Channel through an area called Glacier Alley. Living up to its name, the passage features a number of impressive tidewater glaciers flowing down from the Darwin Mountains and Darwin Ice Sheet on the north shore. Most of them are named after European countries - Holland, Italy, Germany, Spain, and France. By early morning, Stella Australis is once again cruising across Nassau Bay to Cape Horn. Your itinerary repeats the shore landings and other activities from Day 2. However, second landings at some of the more iconic spots along the route can sometimes be more rewarding than the first time around and give you more time to explore each place in depth. At Wulaia bay, explore the small museum in much more depth, strike out on a longer walk than last time or birdwatch along the shore. Before leaving Wulaia Bay, drop something into the wooden mail barrel inside the museum, letters or postcards meant to be hand delivered by future travelers, an ancient mariner tradition revived by Australis. 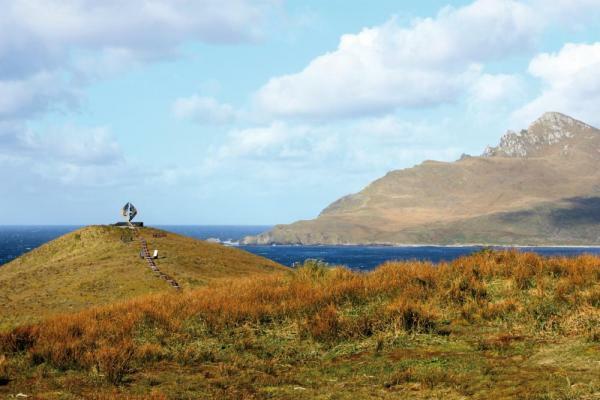 At Cape Horn you have a second chance to visit the Stella Maris Chapel, chat with the lighthouse keeper and his family, or photograph the unusual sub-polar flora that covers the heights. This second approach also increases your chances of landing on Cape Horn Island. After a final night aboard Stella Australis, sail back into Argentine waters and dock in Ushuaia. Acknowledged as the southernmost city in the world, Ushuaia (Argentina) was founded in 1884 and was one of the original points of contact between the indigenous Yámana and European cultures. Its name derives from the Yámana word for ‘penetrating bay’ and it’s surrounded by the southernmost Andes peaks. With around 65,000 inhabitants, Ushuaia is now the second largest city in Tierra del Fuego (after Rio Grande). Embark on the brand new Stella Australis, launched in 2010 for Patagonia cruising. Part of the Australis fleet, the Stella has 100 cabins each feature picture windows, private facilities & satellite phone. Magallanes Deck, 16.5 m2. Private facilities, picture window, climate control, satellite phone. Terra Del Fuego Deck, 16.5 m2. Private facilities, picture window, climate control, satellite phone. Cabo de Hornos Deck, 16.5 m2. Private facilities, picture window, climate control, satellite phone. Terra Del Fuego Deck, 20.5 m2. Private facilities, picture window, climate control, satellite phone. Cabo de Hornos Deck, 20.5 m2. Private facilities, picture window, climate control, satellite phone.